Choosing the right set of equipment for a kayaking trip will equip you with all the tools necessary to handle an unforeseen situation. The right kayak will make your trip fun and easy. Therefore, here are the top 10 factors that you should consider while choosing the best fishing kayaks for your trip. It is not a wise idea to go for a kayak that expert kayakers use. These experts have the knack of understanding the water flow around them and make calculative moves accordingly. In case you are a beginner, you should choose a kayak that allows you to focus more on stability than anything else. Kayaks are broadly classified into two different types, that is, sit-in and sit-on kayaks. If you are looking for ample amount of space for your fishing equipment, the sit-in kayak is a suitable option for you. 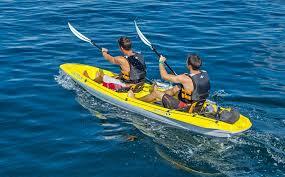 Kayaks are made up of several materials like hardened resins, plastic, polyethene, wood, etc. Choosing the kayak material depends on the kind of portability that you wish to have with the equipment. It also depends on where and how are you going to use the kayak. For a professional kayaker, the kayak with a high hull is perfect since he/she can navigate through whitewater rapids easily. However, for beginners, it is advisable that you go with kayaks that focus on a lower centre of gravity for excellent stability. Some luxurious kayaks come with luxurious amenities like padded seats, beer coolers, etc. So, if you are looking to cruise while fishing, you can go for such a kayak. In case you just want to have a peaceful time, you can go for a simpler version of a plain and affordable kayak. Kayaks are also classified into paddled and pedalled versions. If you are a novice and have not paddled a kayak before, you can go for the pedalled version that is relatively easier to operate. If you are going to go on a fishing trip that is filled with rapids and shallow waters, it is advisable to go with a kayak that has a higher hull. However, in case of a placid lake, you can go with a stable low hulled kayak. The size of kayak that you select depends vastly on the amount of equipment that you wish to carry on the fishing trip. Some modern-day kayaks also come with an electric motor that propels the kayak through a lake. You can go for a single or a double seater kayak based on your requirements.Make sure your kayak carry your all marine accessory like marine battery,marine inverter,motor etc. It is advisable to select a branded kayak and wear a life-vest at all times when you go on a fishing trip.